A Pathfinder Society scenario designed for 5th-level PCs. Release: This Pathfinder Society Playtest Scenario will be available for FREE on August 7, 2018. The plot structure was poor, the skill challenges exposed weaknesses in 2nd editions mechanics and the final fight was tedious. Will these 5th-level playtest scenarios come with pregens? I'm seconding the question about pre-gens. If we're running his soon after it drops do the players have to play 5th level pre-gens or must they build a 5th level character to play it? This is kind of important for promoting this for our event. 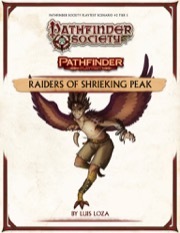 The adventure itself won't come with 5th-level pregenerated character, but there will be 5th-level pregens available elsewhere on paizo.com. I'm ordering maps and minis to run this at GenCon. Do we know what maps are needed to run this scenario? This should be a fun one as well, can't wait! !